Four Underclassmen Probable for Lineup at Schenkel Clemson will be competing in the Chris Schenkel Intercollegiate March 25-26 in Statesboro, GA. The two-day, 54-hole event will be held at the par 72 Forest Heights Country Club in Statesboro, GA. Georgia Southern is the host school. Clemson is the defending champion. Head Coach Jonathan Byrd, Clemson’s senior leader, will lead the Tigers to Statesboro, while Lucas Glover and John Engler are two returning junior All-Americans. D.J. Trahan, Clemson’s top golfer so far this spring, is schedule to be joined in the lineup by freshman Ben Duncan, who will be playing in his fourth tournament. Clemson Defending Champion at the Schenkel Clemson overcame a five-stroke deficit entering the final round, then defeated Georgia on the second hole of a sudden death team playoff to claim the championship of the 1999 Chris Schenkel Invitational at Forest Heights Country Club in Statesboro, GA. The victory was Clemson’s fifth tournament title in eight events for the Tigers, who did nothing to hurt their consensus number-one ranking. The fifth victory of the year tied the Clemson record for tournament championships in a season. Clemson also won five tournaments in 1986-87 and in 1987-88. The 15-team field included seven of the top 20 teams in the nation. Clemson shot a 291 on Sunday and had an 869 total for the 54 holes, the same score as Georgia, who had a 296 in the final round. Both teams counted four pars on the first extra hole, then Clemson won the event on the second extra hole. South Carolina finished third, while Florida was fourth, Duke and TCU were tied for fifth and Augusta State was seventh. East Tennessee State ranked eighth, while Georgia Tech was ninth. Georgia Tech, ranked third in the nation, has not beaten Clemson this year. Jonathan Byrd led the Tigers with a 69 in the final round and a fourth-place overall ranking. It was his sixth top 10 finish in eight events and his final round 69 was his ninth round in the 60s this year. Michael Hoey and Lucas Glover shot final round scores of 73 and both finished in the top 20 overall for the event. Hoey, a freshman from Ireland, finished 13th at the event with his 219 54-hole score, while Glover, a native of Greenville, and Wade Hampton High School, had a 221 score to rank 19th. John Engler had a 76 on Sunday and finished 15th for the event with a 220 score. Jani Saari, playing in his first career tournament, shot a 79 in the final round for a 224 score and was 34th. Saari’s 73 and 72 in the first two rounds counted toward Clemson’s team score. It marked the second time that Clemson has won the Schenkel. Clemson won the event in 1988 with an 854 team score, then finished second in 1989 with an 853. Clemson played in the event every year between 1980-89, then the tournament was disbanded until last year. Clemson was also the runnerup in 1986. Helping Trahan was junior Jonathan Byrd shot a 70, giving John Engler had a 74 and Ben Duncan shot a 76 to round out Clemson’s five players. Four Tigers under 72 average for the year Clemson’s top four golfers all have stroke averages under 72.0 for the academic year. Lucas Glover leads the way with a 70.86 for the year, including a 70.20 for the fall season. Freshman D.J. Trahan has a 71.33 stroke average for the year, second best on the team. That includes an incredible 70.17 for the two tournaments in the spring. He has been Clemson’s low scorer in each of the first two spring events, and now has three top 10 finishes for the year, including the medalist honors at the Las Vegas Intercollegiate. Jonathan Byrd, a first-team All-American last year, has a 71.81 stroke average, a figure that would be his career best for a season, but it is only fourth best on this year’s team. Byrd Ranked 2nd in World Amateur Rankings Two Clemson golfers are ranked among the top 20 amateurs in the world based on ratings released in Golfweek through events of March 6, 2000. Jonathan Byrd is ranked second with 200 points, while Lucas Glover is 18th with 95. Glover just completed a terrific fall season and has jumped ahead of Matt Kuchar in the rankings. Byrd trails only Hunder Huss of Norman, OK and the University of Oklahoma. Edward Loar is ranked third, while David Edger, Charles Howell and Aron Baddeley (Australia) are all tied for fourth. Current Tigers Rank one-two-three Current Clemson golfers Jonathan Byrd rank 1-2-3 in Clemson history in career stroke average. The latest figures that include this academic year show Engler ranked first with a 72.31 average. 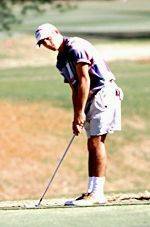 He posted a 71.39 figure for the fall of 1999 in has a 71.67 stroke average for this academic year over 24 rounds. Glover, now ranked second nationally, made the biggest jump, on the career list this year. His 70.86 average for 21 rounds this year had a lot to do with that. Glover now has a 72.34 stroke average for his 92 career rounds. Jonathan Byrd, the only senior on the Clemson team in 2000, has a 72.61 average after firing a 71.81 average this year. Fourth on the list is Chris Patton, who had a 72.71 average between 1986-90. Last week he won a Tear Drop Tour event in Florida. Clemson Number-three in MasterCard Poll Clemson was ranked number-three in the March 6 Mastercard poll, just behind ACC rival Georgia Tech and Northwestern. Clemson concluded a strong fall schedule with a first at the Jerry Pate Intercollegiate and second place finishes at the Ping/Golfweek Preview and the Carpet Capital Classic. The Tigers were fourth at the San Juan Shootout, and Georgia Tech won the event and thus moved into first in the poll. Clemson was sixth at the Las Vegas Intercollegiate, but just two strokes the from the championship score. Clemson has four of the top 40 golfers in the nation according to the latest Mastercard rnakings. Lucas Glover leads the way at number-three in the nation. D.J. Trahan was 32nd heading into the Las Vegas Intercollegiate, so his ranking should skyrocket after his victory. Tigers in Final Individual Rankings Three of Clemson players ranked in the top 20 of the Mastercard and Sagarin individual rankings for the 1998-99 academic year. All three return for this year. Jonathan Byrd was a consensus top 10 player according to Mastercard, Sagarin and Golfstat. John Engler made the top 10 in Mastercard and Sagarin and was 14th in Golfstat. Jani Saari, who finished 77th in Sagarin, and Michael Hoey, 53rd in Mastercard, were also top 100 college players in 1998-99. Byrd Named Academic All-American Clemson golfer Jonathan Byrd chosen to the 1999 Academic All-America team according to the Golf Coaches Association of America and the College Sports Information Directors of America. Byrd was named first-team All-American for his performance on the course in June. Byrd was the only golfer in the nation in 1999 to earn first-team Academic honors and first-team All-America honors on the course.